Democrats put on a united bid to question the legitimacy of Donald Trump's election victory on Monday with the Clinton campaign returning from the dead to join in. In a series of developments the White House, the Clinton campaign and Democrat members of the electoral college all pounced on reports that the CIA believe Russian wanted Trump to win the election. A group of electoral college members - aided by an anti-Trump Republican - demanded a security briefing on the CIA's findings - a clear attempt to influence other members of the college who are not bound to vote for Trump. Then they were backed by John Podesta, Clinton's campaign chairman, who launched a tirade against the media, claiming - in the teeth of overwhelming evidence - that claims of Russia interfering in the election had not been covered enough before voting day. Next to the fray was the White House, which accused Trump of inviting Russia to hack Hillary Clinton, ending weeks of detente in the wake of the election result. The attacks appear to be a concerted attempt by the Democrats to turn next week's vote by members of the electoral college into a massive question over the legitimacy of the result. The three attacks came in the wake of a report in the Washington Post that the CIA had concluded Russia hacked both parties' systems but released only material which would embarrass the Democrats. That was roundly rejected by Trump at the weekend and on Monday morning, as he said it was impossible to know who had hacked Clinton's efforts, and his campaign compared the CIA conclusion to the intelligence consensus that Saddam Hussein had weapons of mass destruction. The White House's intervention came when spokesman Josh Earnest was asked to respond to Trump's position. But he spoke knowing that just hours earlier Clinton's campaign chairman had given public support to a letter from 10 members of the electoral college who are demanding an intelligence briefing on claims Russia interfered in the election's result before they cast their votes. 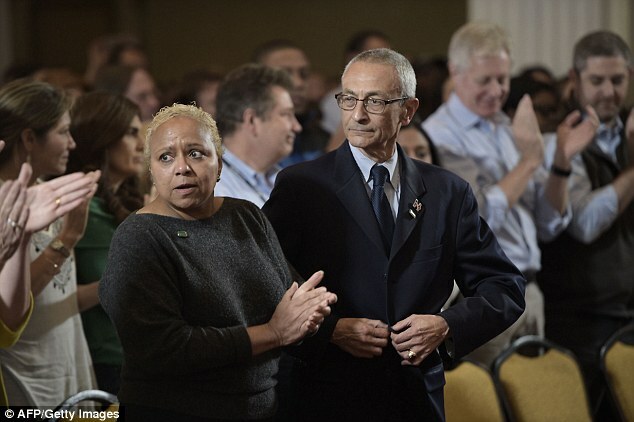 John Podesta, the aide whose leaked emails were a source of embarrassment as they revealed Clinton's campaign secrets, said the electors should 'have their questions addressed'. 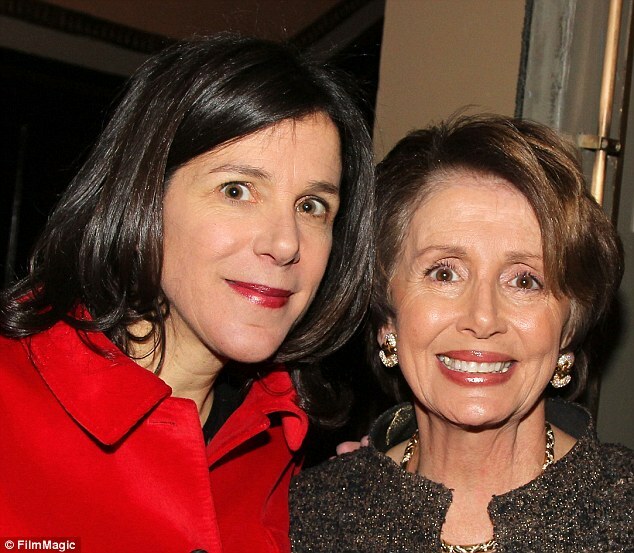 The demand from the electors was made in a letter posted on Medium and led by Christine Pelosi, whose mother is the Democrats' leader in the House of Representatives, Nancy Pelosi. 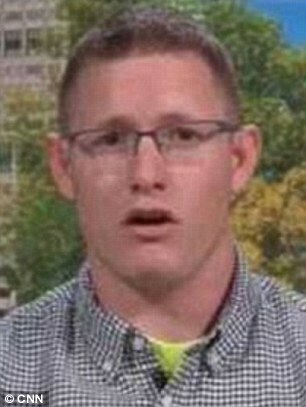 They described themselves as a 'bipartisan' group although only one is a Republican, who had already stood down from the college so he would not have to vote for Donald Trump. 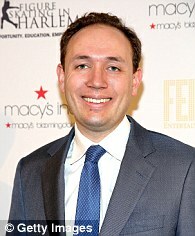 The Electoral College members will cast their ballots on December 19 for President of the United States. 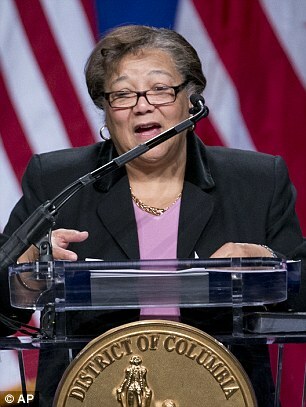 Delegates from a majority of states are required to mark down the candidate who won the most votes in their statewide election. But 20 states allow free votes - and the group of nine Democrats and one Republican are trying to influence them to vote against Trump. Most of the 10 will be voting in line with their party loyalties. But the 10 include a leading advocate of the faithless elector strategy who was a 'never Trump Republican'. They want an intelligence briefing before they cast their ballots. The move would imply that they think Trump would be considered tainted by the college and not be voted into office. The electoral college has never defied the will of voters. In two cases it was unable to reach a majority, and the election went to the House of Representatives - in 1800 and 1824. In the letter they say: 'The Electors require to know from the intelligence community whether there are ongoing investigations into ties between Donald Trump, his campaign or associates, and Russian government interference in the election, the scope of those investigations, how far those investigations may have reached, and who was involved in those investigations. Podesta responded with an accusation that the media had ignored their claims that Russia was hacking - a counter-factual claim which flies in the face of what actually happened in the campaign. 'Each day that month, our campaign decried the interference of Russia in our campaign and its evident goal of hurting our campaign to aid Donald Trump. Electors from five states and the District of Columbia signed the document. 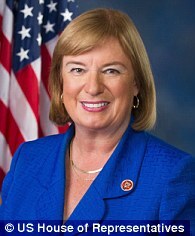 In addition to Pelosi's daughter Christie, former New Hampshire Rep. Carol Shea-Porter is part of the effort. Another name familiar to the electoral fight is Michael Baca, a Colorado Democrat pushing Republican electors to change their votes from Trump to Mitt Romney, John Kasich or some other consensus candidate. 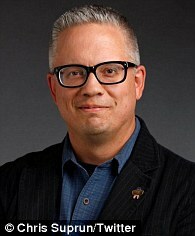 Only one of the electors who signed the open letter to Director of National Intelligence James Clapper is a Republican - Texas' Chris Suprun. He has already indicated he will stand down before the vote because he will not vote for Trump. Christine Pelosi posted the letter to Medium. It points to 'allegations that Donald Trump was receiving assistance from a hostile foreign power,' reports that the Kremlin interfered in the U.S. election and Trump's invitation to Russia to hack Hillary Clinton's email address. It also takes aim at Trump's rejection of an October intel report expressing high confidence that Vladimir Putin's government was behind the hacking. On Monday he tweeted further on the topic, saying that unless a hacker was caught in the act, it was 'very hard to determine who was doing the hacking'. The electors have not voted yet. Trump is due to receive 306 votes to Clinton's 232. He needs 270 to win. 'Trump's willingness to disregard conclusions made by the intelligence community and his continuing defense of Russia and Russian President Vladimir Putin demand close scrutiny and deliberation from the Electoral College,' Pelosi said on Medium. Roger Stone, a Trump confidante who did not work for the campaign but acted as an advocate of the billionaire, back-channeled with Wikileaks Julian Assange, she said. Former Trump advisor Carter Page traveled to Moscow just before a hack on the Democratic National Committee, and he's there this week. Trump National Security Advisor Michael Flynn came to Russia in 2015 for a dinner celebrating the government's state-run new organization, RT. 'The Electors will separately require from Donald Trump conclusive evidence that he and his staff and advisors did not accept Russian interference, or otherwise collaborate during the campaign, and conclusive disavowal and repudiation of such collaboration and interference going forward,' Pelosi writes. 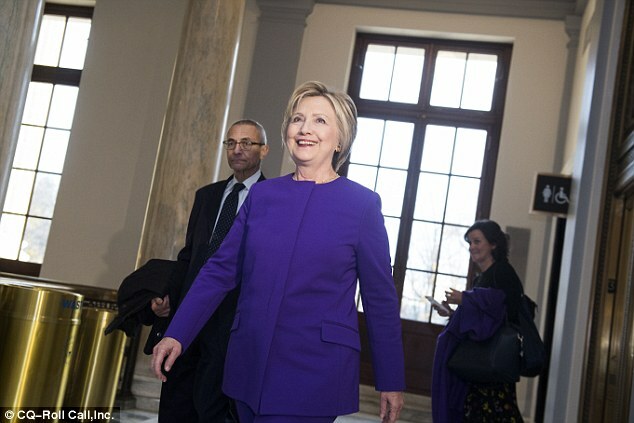 She told Politico the electors want 'temporary security clearance' so they can review the evidence and the 'American people can learn the truth about our election. Clinton's campaign chairman said, 'The bipartisan electors' letter raises very grave issues involving our national security. 'Electors have a solemn responsibility under the Constitution and we support their efforts to have their questions addressed,' John Podesta said. The senior aide to Clinton, who was seen at her arm on Thursday when she came to Capitol Hill, noted that their campaign tried to draw attention to this very issue before the election. 'Each day that month, our campaign decried the interference of Russia in our campaign and its evident goal of hurting our campaign to aid Donald Trump,' he said in a statement. 'Despite our protestations, this matter did not receive the attention it deserved by the media in the campaign. The hack on Podesta's emails was devastating to the Clinton campaign. Day after day, week after week, Wikileaks pushed out messages from Podesta's account revealing disputes within the ranks of the Clinton Foundation and the Democratic nominee's presidential campaign. Clinton communications director Jennifer Palmieri and other aides told Yahoo News that they were targeted by foreign actors toward the end the of the campaign. 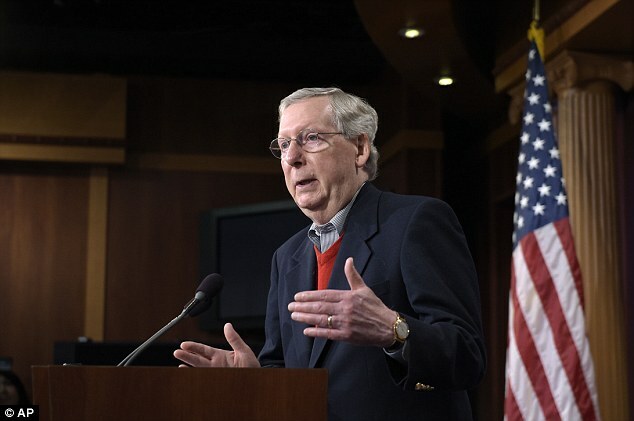 Senate Majority Leader Mitch McConnell gave his blessing today to a Senate probe into Russian hacking. Republican Senators John McCain and Lindsey Graham and Democratic Senators Jack Reed and Chuck Schumer, soon-to-be the highest ranking Democrat, asked Congress 'to examine these recent incidents thoroughly'. 'Regardless of the outcome of the election, the American people deserve to know the truth and a commitment to protect our democracy from foreign meddling,' hse said. Pelosi put her support behind a proposal from House Oversight and Government Reform Committee Ranking Member Elijah Cummings and Intelligence Committee member Eric Swalwell to establish an independent commission to review the matter. House Speaker Paul Ryan is refusing to authorize such a commission. President Barack Obama has ordered a separate review of the hacking the intelligence community for his own purposes. The report may not be made public because it will contain classified information, the White House said. White House Press Secretary Josh Earnest said in a briefing on Monday that the Oval Office believes the matter should also be investigated by Congress. Trump called on the Russians to infiltrate Clinton's email, Earnest said, incredulously.